April is fast approaching again and that only spells SUMMER! Here in Dagupan City, the annual celebration of Bangus Festival is being held during this time of the year. 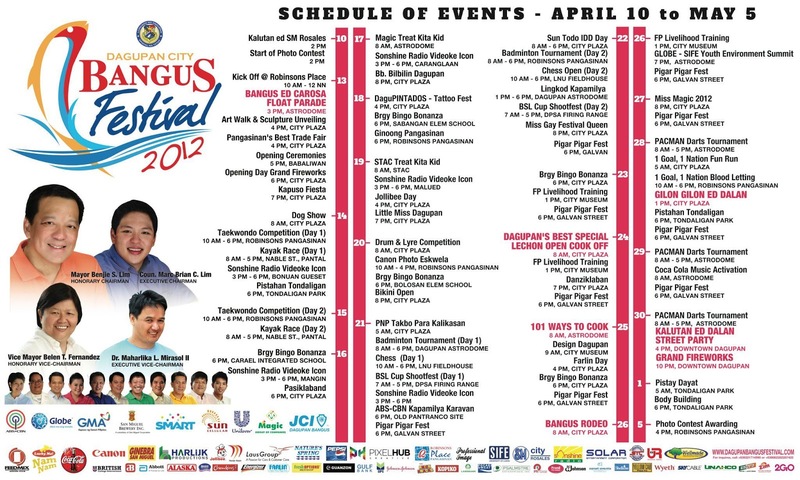 This year, 2012 Dagupan City Bangus Festival will be celebrated from April 13 to May 1, 2012. Some of the highlights for this year's celebration are: Bangus Ed Carosa Float Parade, Dagupan's Best Special Lechon Open Cook Off, 101 Ways to Cook Bangus, Bangus Rodeo, Gilon Gilon Ed Dalan, Kalutan Ed Dalan Street Party and Grand Fireworks.